This post is sponsored by #Isopure. As always, these are my own honest opinions about the product. Thanks for reading this post, which is helping to give me the financial support I need to keep providing great free content on my blog. I appreciate it! Refueling after a hard workout is incredibly important—you want to supply your body with the nutrients it needs to repair and rebuild muscle. Eating or drinking the right things after a workout can really help enhance and accelerate your recovery. I occasionally have a hard time eating right after a workout, which is why I turn to smoothies so often to help me refuel. 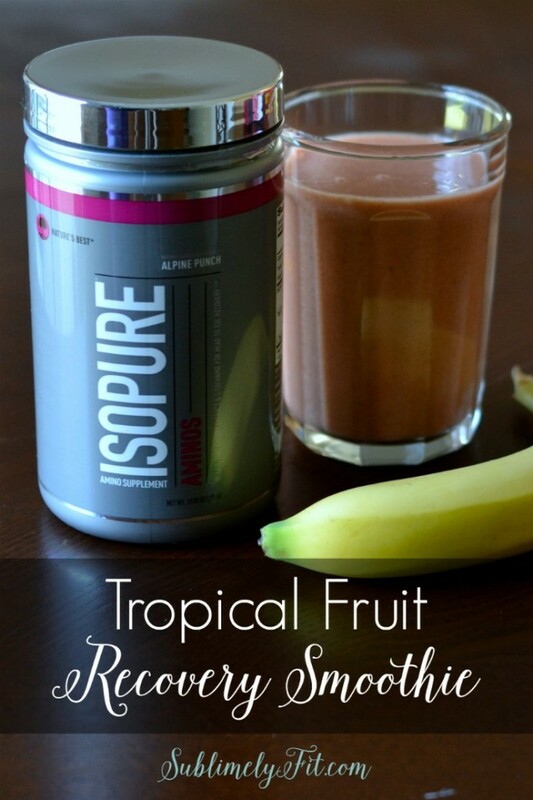 Today I’m sharing a recipe for a yummy Tropical Fruit Recovery Smoothie made with Isopure Aminos, full of great ingredients to help stimulate recovery after intense exercise. A few weeks ago I wrote about Isopure Aminos, a supplement that you can take along with your usual protein powder to really help jump start your recovery from workouts #behindthemuscle. 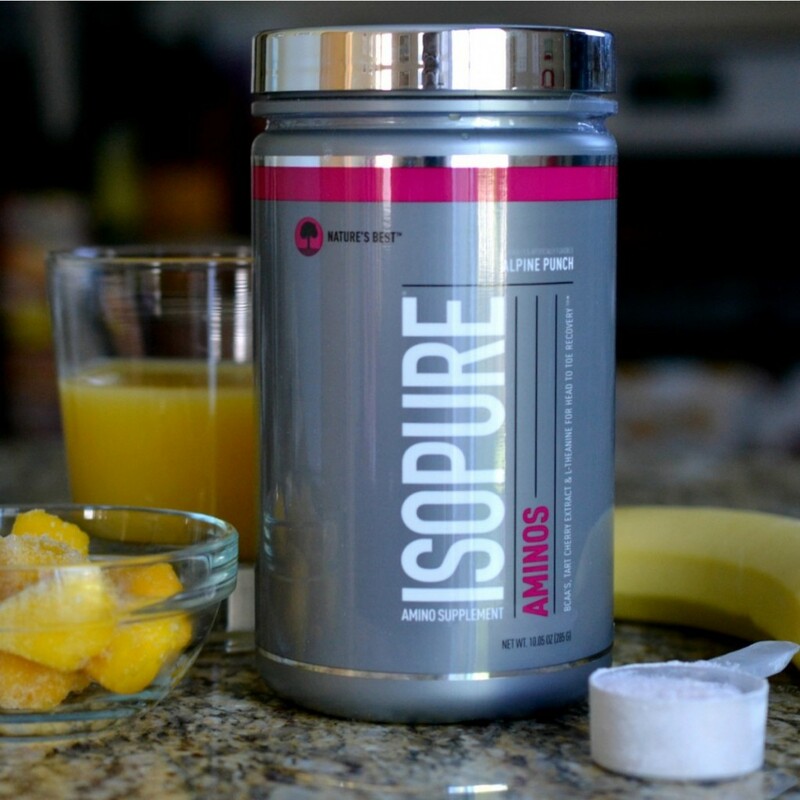 I’ve been using Isopure Aminos for about a month now after my barre workouts and my hard runs, and I do think I’ve felt a difference. I’m less sore and I think I’ve been getting stronger than I would have otherwise without my regular Isopure smoothies. I’ve tried mixing the Alpine Punch flavor with chocolate protein powder, which is pretty tasty, but after experimenting, I found that my favorite combination involves mixing it with tropical fruits for an island-inspired smoothie. This recovery smoothie combines banana, mangoes (an awesome superfood! 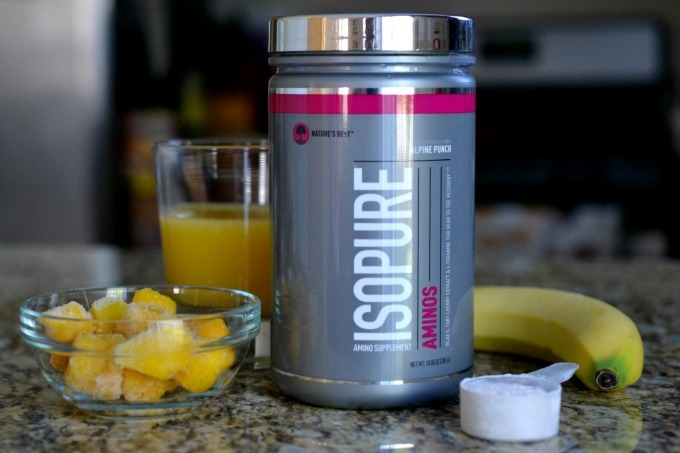 ), and a little orange, along with the tropical punch flavor of the Isopure Aminos. I threw some orange juice in mine to get in a little extra Vitamin C, an antioxidant, but if you’re trying to avoid adding extra sugar to your diet, you could mix yours with water, maybe adding in a little stevia for sweetness if you feel like your smoothie needs it. I’ve personally had very good luck refueling with this smoothie. The carbs from the fruit combined with protein from the protein powder are excellent for helping to restock the glycogen stores in my muscles as the protein helps with muscle repair. The smoothie tastes great, and I feel great! It’s my favorite new way to refuel, and I hope it works well for you, too! What’s your favorite recovery smoothie/meal? I LOVEEEE A mango banana smoothie. One of the best combinations out there!